Is this the best-kept secret in New Zealand? The climate is wonderful, the sailing easy and the best vineyards in the country just a few kilometers away. If that isn’t enough, the boatie facilities and shopping is excellent. But I shouldn’t be mentioning this, as I should be keeping this to our selves. 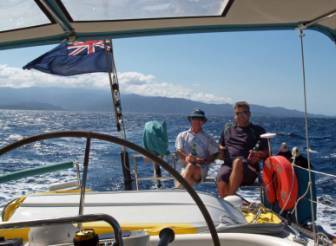 We have a number of friends down here and have been having a very jolly time taking them out sailing and racing with the Tasman Bay Cruising Club in their boats. Fierce competition amongst a variety of small keel boats. 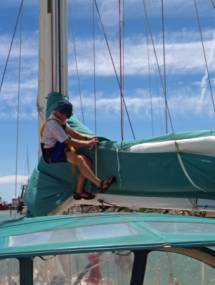 One of the major hassles we have found with the boat was the strange version of the mainsail stack pack, the nappy as we renamed it. The main problem is that the boom is too high and even with mast steps it is impossible to reach the head of the sail to attach the cover let alone close the zip. The original “nappy” came in three pieces. One central section with the jack stays attached and two other pieces that are attached at either end of the boom to cover the sail. These came with fasteners to clip onto the mid section and the whole was zipped together. What a performance it was to hoist Simon in the bosun’s chair to assemble the contraption!